Product Condition: The Threadborne Jacquard Polo Shirt - Men's is in Excellent condition. This shirt is missing its tags but it looks brand new. It still has its creases from when it was originally folded. There are no defects and no stains. 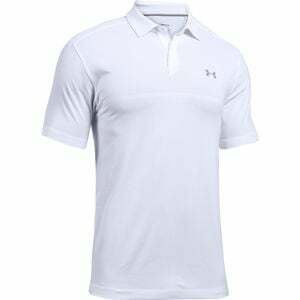 From the back nine of your favorite golf course to laid-back Fridays at the office, the Under Armour Men's Threadborne Jacquard Polo Shirt brings upscale style and smooth-wearing comfort to outdoor recreation and causal business situations. Threadborne fabric is incredibly soft against your skin, so you'll never feel uncomfortable while you're playing outside or getting work done. This fabric wicks moisture off your skin as you start to perspire, aiding your body's natural cooling process for an utterly cool, dry feel. Plus, it's free of the static cling you've come to associate with traditional polyester-based shirts. As a bonus, it's fabricated with four-way stretch to maintain full range of motion needed for golf outings and long weekends at the lake.